This is part five of a twenty-five part series chronicling my budding collections of the 2016 World Series champion Cubs. Obviously, I’ve already starting showing off some of those cards, but I wanted to offer a formal introduction to the various players. With my legacy player collections, I’m still going to attempt to show every single card on the blog, but with these new guys I’m taking a different approach as you’ll see here where I lump cards in one scan, and will probably skip many of the more basic cards I get unless I can get a good theme together. I realized recently that if I’m going to do this series, that I might need to get some of the relievers out of the way first. They don’t have very many cards overall, which means I don’t have many of their cards. And if I’m doing other posts with various topics or themes that might include those cards, then I won’t have anything left over for this series. So, hello Justin Grimm! You’re next in line! 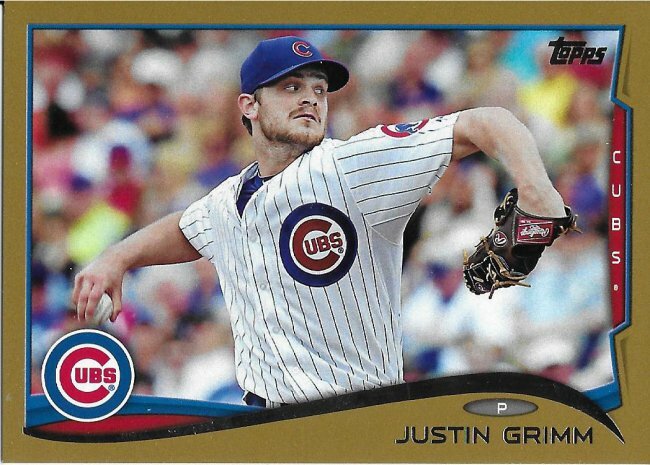 Justin Grimm was originally drafted by Boston in 2007, but decided not to sign and was then drafted again in 2010 by the Texas Rangers (moving up 8 rounds). He made his MLB debut in 2012 with the Rangers and started in 2 of his 5 games, garnering one win and a 9.00 ERA over 14 innings. 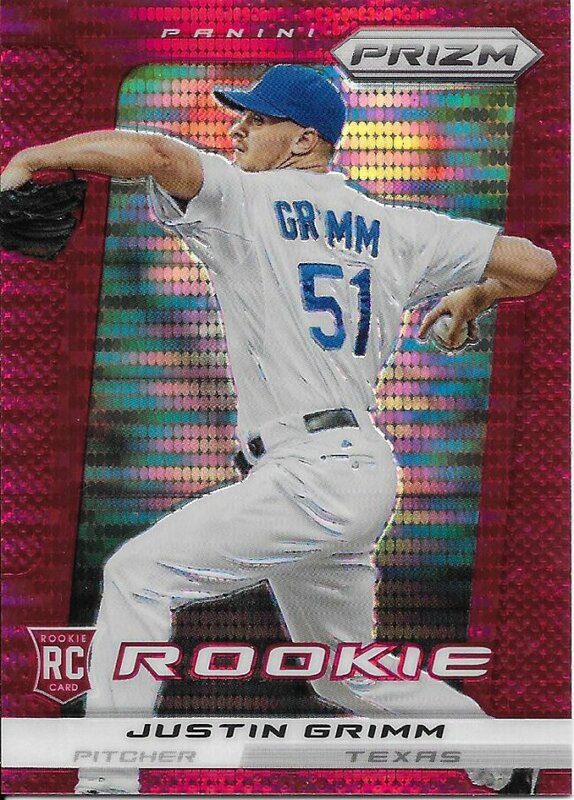 Side note: This was the only Grimm card I found at NSCC. Despite that performance, he was brought back to the Rangers the next year and started 17 more games. That wound up with a 7-7 record and a 6.37 ERA. That ended his starting career (so far, at least) as he was traded mid-season to the Cubs. Coming to the Cubs was Mike Olt and Carl Edwards Jr. (and Neil Ramirez as the PTBNL) in exchange for Matt Garza going that way. Worked out well for Chicago. Overall in his time with Chicago, Grimm was better as a reliever. He gave us a 3.82 ERA over 5 years and 269 Ks in 235.2 innings and a 1.248 WHIP in the regular season. In 2015, he was particularly good with an ERA under 2. In the postseason that year, he allowed no runs in three games, 2 full innings and 4 Ks. 2016 Postseason was not as good, but he still contributed overall to the team and earned his ring. 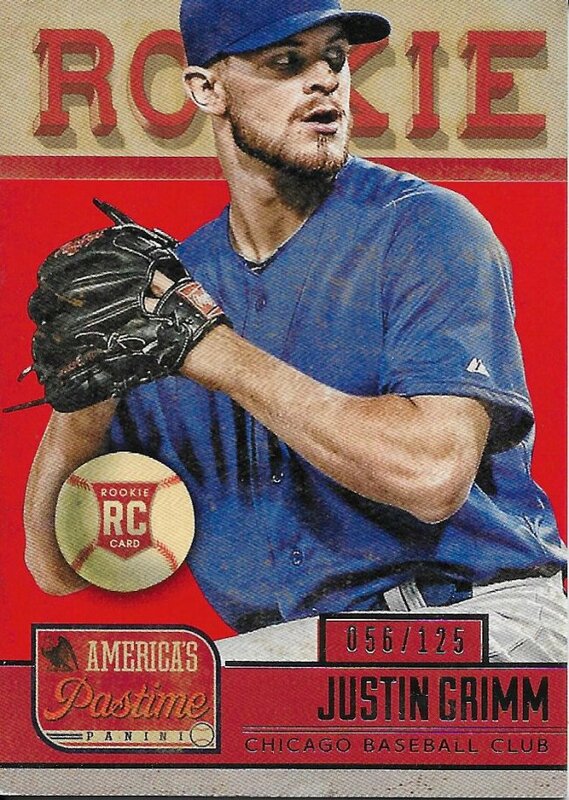 Ultimately, Justin was released by the team on March 15, 2018 and signed with the Royals a couple days later (and is currently on the DL as I’m writing this). I wish him luck going forward. He showed that he certainly has potential and he really gave us a lot of good innings when it mattered most.